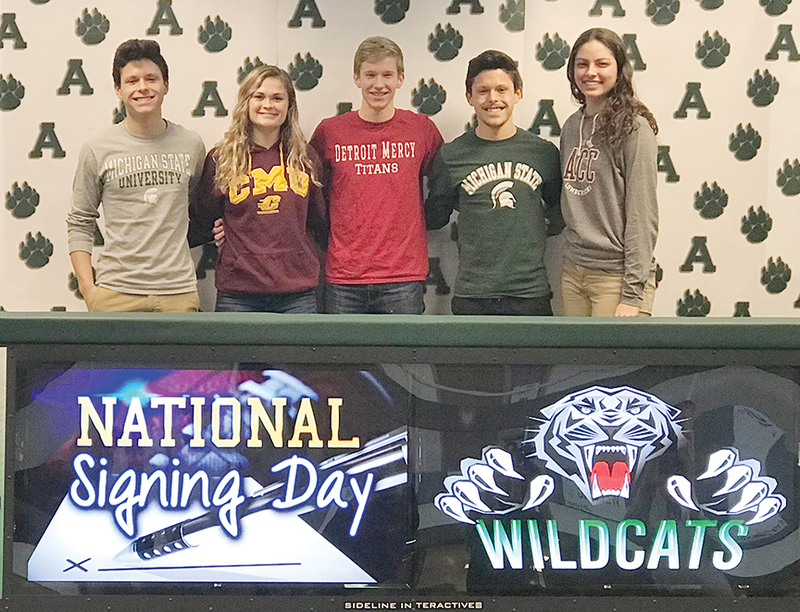 News Photo by Jonny Zawacki Ten Alpena High School student-athletes signed their National Letter of Intent to continue their academic and athletic careers last week and were recognized on Monday in the Alpena High media center during the school’s National Signing Day presentation. Pictured left to right are: Aden Smith, Maddy Boyd, Zach Zaborney, Josh Smith and Jessica Leeck. Not pictured: Faith Weide, Emma Fraser, Alexis Pilarski, Allison Precord and Aidan Day. The 2018-2019 school year has been special for Alpena High School. On Monday, the school held its annual signing day in the media center for seven athletes, who formally announced their college plans after signing their National Letters of Intent last week. Maddy Boyd (Central Michigan University), Aden Smith (Michigan State University), Josh Smith (Michigan State University), Emma Fraser (Alma College), Faith Weide (Western Michigan University), Jessica Leeck (Alpena Community College) and Zach Zaborney (University of Detroit Mercy) each announced their plans on Monday and joined Logan Guthrie (Central Michigan University) and Aidan Day (Colorado Christian University), who both signed early and are off their respective schools preparing for their freshman season. “This particular spring, we’ve had more signees than ever before. We have 10 signees, seven of whom were present today and it really shows how strong our athletic program is right now and we couldn’t be happier for the athletes and coaches who have helped make this possible,” AHS Athletic Director Tim Storch said. Weide signed her LOI to attend Western Michigan. 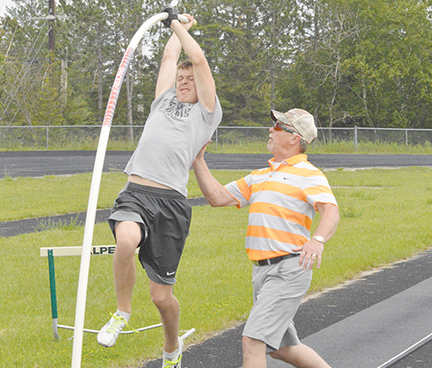 She will enter her fourth year as a member of Alpena’s track and field team where she has excelled in field events. 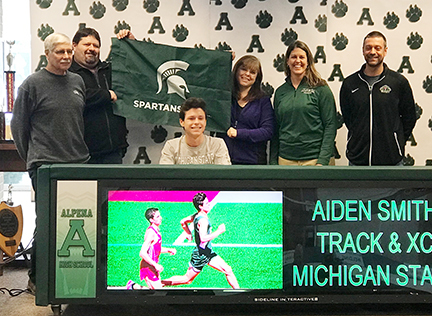 News Photo by Jonny Zawacki Aden Smith will run track and cross country at Michigan State. As a sophomore, Weide qualified for the state finals in the shot put and as a junior she qualified for the finals in the shot put and discus, while earning all-state honors in the shot put. 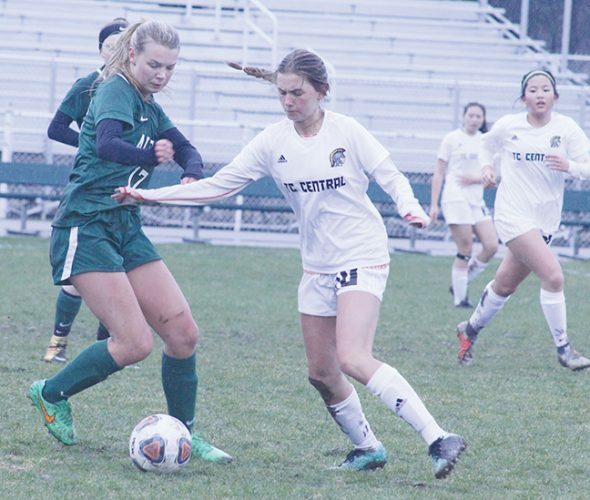 With her senior year remaining, the expectations for Weide are clear as she looks to qualify for the finals for the third consecutive season and earn all-state recognition in back-to-back seasons. Aidan Day will continue his soccer career at Division II, Colorado Christian University. He signed his LOI early and is currently preparing for his freshman season which will begin in the fall. Day cemented himself as arguably the best soccer player to come out of Alpena as he finished his career with a handful of records including most points in a career (90), most goals in a career (55), most assists in a career (35) and most goals in a game (6). 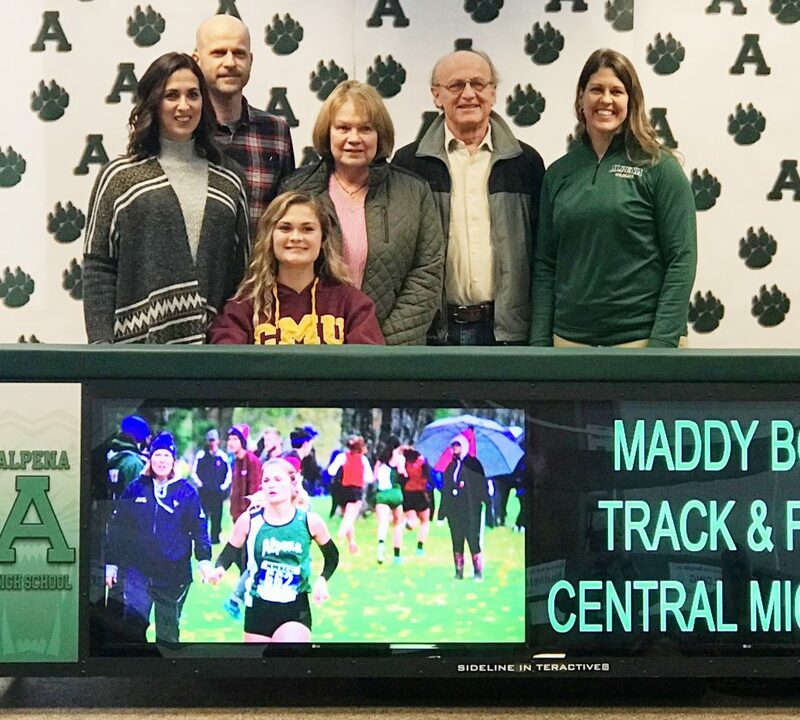 News Photo by Jonny Zawacki Maddy Boyd will run cross country and track at Central Michigan University. For his efforts, Day was ranked as the No. 1 player in the Big North Conference, he was ranked as the top player in the district and region while receiving all-state honors during a special senior season that capped off a special career. Boyd will compete in track and field along with cross country at Central Michigan. During her cross country career, Boyd was a two-time all-BNC honoree, two-time all-region, two-time state qualifier and earned all-state honors her senior year. Boyd also holds an Alpena girls record by running a 5K in 18:30. As good as Boyd’s cross country career was, her track and field career has been just as special. 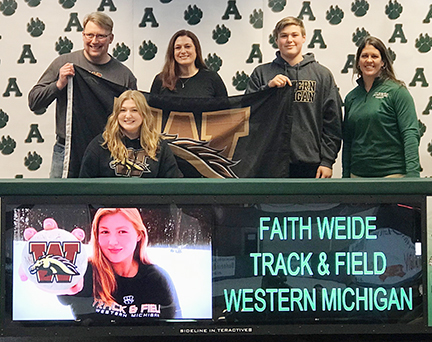 News Photo by Jonny Zawacki Faith Weide will compete in track and field at Western Michigan University. Boyd still has her senior season left, but has already earned all-BNC honors two times in the mile and all-region two times in the mile. Boyd was also all-BNC in the two mile, all-region in the two mile and all-region in the mile relay. Boyd also holds the school record for the mile with a time of 5:12.45. 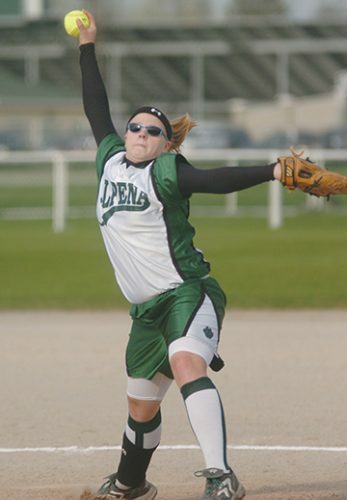 Fraser was part of a special softball tradition at Alpena and will finish as one of the top players to go through the program. 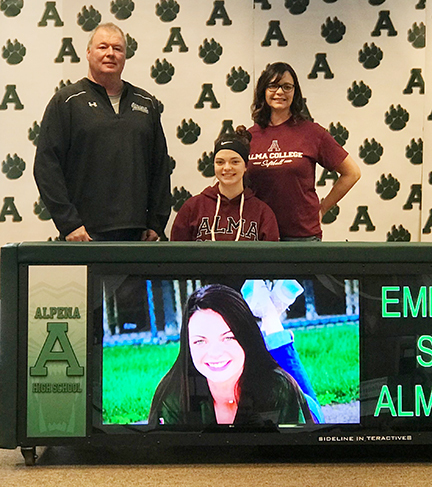 Fraser signed on to play collegiately at Division III, Alma College who also has a strong softball tradition and is typically among the top DIII teams in the region. With her senior season still to go, Fraser already has put together a storied career. Fraser is a four-year varsity player and has been a staple at the top of the lineup and a valuable arm in the circle. Fraser earned all-state honors during her junior season as a third baseman while breaking her own doubles record she set during her sophomore year as she doubled 22 times last season and finished her junior campaign with a .540 batting average, .839 slugging percentage and .630 on base percentage. Fraser also hit five home runs, drove in 39 runs and scored 57 runs and could break a few more career records this spring. Leeck will stay at home and attend Alpena Community College where she will play volleyball. 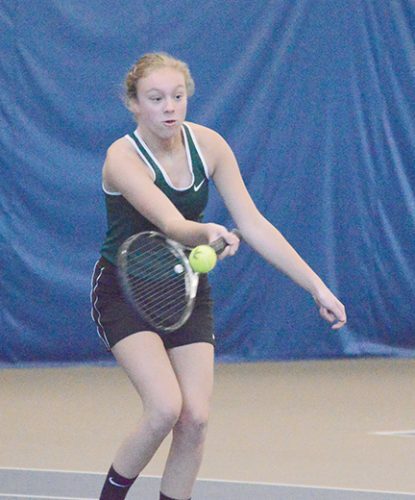 She has excelled as a two sport athlete at Alpena and will take her talents to ACC next fall. 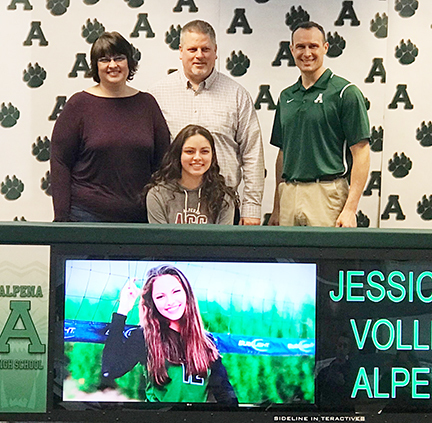 Leeck was a two-year varsity volleyball player and set a goal for herself before the beginning of her senior season to go on and play collegiately at ACC and has now officially fulfilled that dream. Alison Precord and Alexis Pilarski have also tried out and made the ACC volleyball team, but were unable to attend the signing day because of college classes. 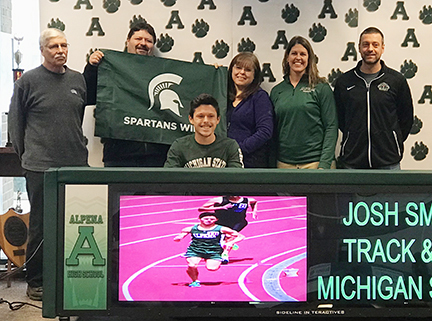 News Photo by Jonny Zawacki Josh Smith will run track and cross country at Michigan State. Zaborney will attend Division I, University of Detroit Mercy and compete in track and field. Zaborney was apart of the cross country teams that earned several team honors in group events, but in track and field Zaborney excelled in the jumps. Zaborney has earned all-BNC in the long jump and all-state in the triple jump and still has his senior to go. He is ready to put an exclamation point on what has been a great career. The final two signees were the Smith brothers who will both attend Michigan State University and compete in cross country and track and field. Aden has been apart of incredible track and cross country teams at AHS. In cross country, Aden was a two-time all-BNC, two-time BNC champion, once a BNC team champion, four-time all-region, two-time regional team champion, four-time state qualifier and three-time all-state finisher. Aden was just as successful on the track and he is all-BNC in the mile, all-BNC and all-region in the two mile and is also part of a 4×8 relay team that has earned all-BNC and all-region twice, along with all-state once. The 4×8 relay team also holds a school record and Aden leaves as one of the top runners to come through the school. Josh was just as successful as he earned three-time BNC honors, was a team BNC champion, three-time all-region, two-time regional team champion, three-time state qualifier and three-time all-state in cross country. On the track, Josh has excelled earning all-BNC in the 800, mile and also all-region in the mile. Josh is also part of the record-breaking 4×8 relay team that has been all-BNC three times, all-region twice and all-state once. Both Smith brothers have their senior track season left to bring home some more honors as Wildcats before becoming Spartans. 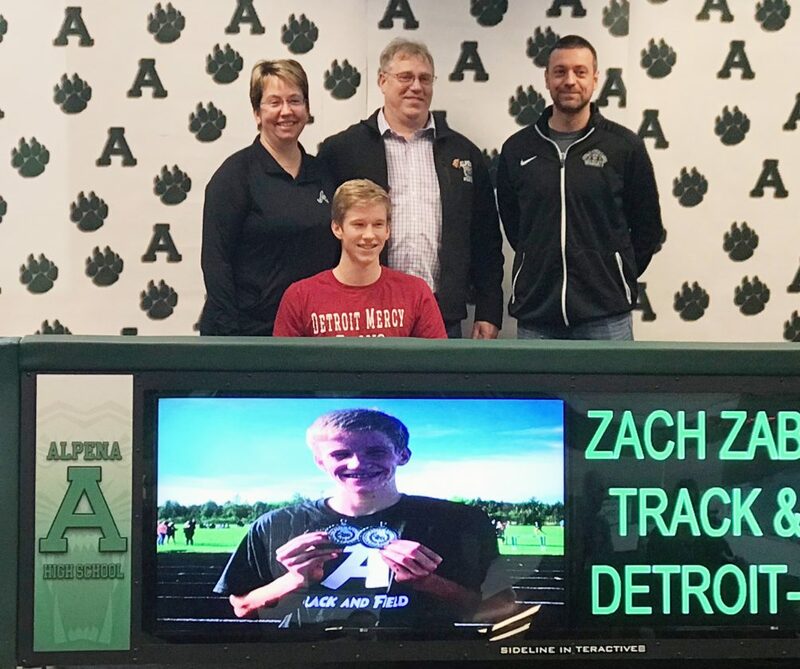 News Photo by Jonny Zawacki Zach Zaborney will compete in track and field at the University of Detroit Mercy.